September has been a crazy month for me… we were traveling to visit family, and when I got back I began the rewrite of a TV pilot for a series I’m creating. 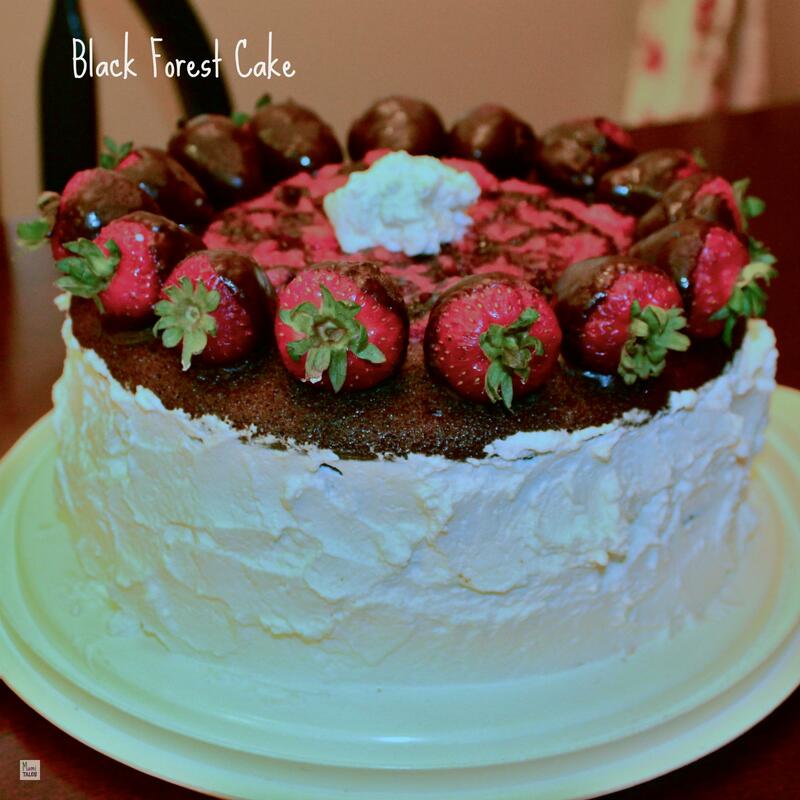 But here I am, almost a month later, to post a recipe for a cake I made during our family visit to celebrate all of August and September birthdays: Black forest cake. I have done this cake at least three times already (here are some pictures of another one for another party), and every time it is an instant crowd pleaser. A delicious dark chocolate cake drizzled with rum, with whipped cream and chocolate covered strawberries. Preheat oven to 375ºF. Prepare 2 9" cake pans with butter and flour, or line them with parchment paper. Cut the chocolate in little pieces and melt in a heavy small pan at very low heat, taking it from the heat as soon as it is done so you don't scorch the chocolate. Set it aside. Pour the batter on the prepared cake pans, dividing them between both pans evenly. Bake until a toothpick in the center comes out clean, about 30 minutes in the center of the oven. Remove the pans and let them cool for 15 minutes. Unmold the cakes and let them cool off completely on a cooling rack. While the cakes cool off, wash and cut the first pint of fresh strawberries. Don't mush them, but cut in little pieces. Add the 3/4 cup of sugar and let it macerate for 15 minutes. Whip the heavy cream with an electric mixer on high speed, until it starts forming soft peaks. Add the sugar and vanilla, and whip some more. Finally, add the tsp of Cream of Tartar, so that the whipped cream does not weep. Once the cakes are cooled, place the first one on a plate, then poke deep holes with a toothpick. Drizzle with half the rum. Place half the cut up strawberries on top of the cake layer. Place the second cake layer over the strawberries. Poke holes in it, then drizzle the rest of the rum. Place the rest of the strawberries on top. For the chocolate covered strawberries, melt the second bar (3.5 oz) of chocolate in the heavy pot pan under low heat, making sure not to burn the chocolate. Once the chocolate is liquid, cover all the strawberries from the second pint, placing on wax or parchment paper. When all the strawberries are covered, place in the refrigerator while decorating the cake with the whipped cream. Drizzle the rest of the liquid chocolate over the strawberry filling a the top of the cake. Take the covered strawberries out of the fridge and finish decorating the cake with them. « $200 Appreciation Giveaway 2014! I’m wishing I had a nice BIG piece of this cake right now! Looks delish! Thanks, Christine! It was absolutely delicious 🙂 You should try and make it! This looks absolutely delicious!! I love black forest desserts and drinks. Thanks for sharing. Thanks for the comment 🙂 I love when the drinks and desserts get combined… as the rum is IN the cake. If you make it, let me know how you like it! I’m gonna pretend I didn’t see the calories. Haha. OMG – that’s GREAT news!